Your New Master Suite Becomes an In-Home Spa! A spa day is always incredible, but who has time to go – or even remember to book the appointment? Cut out the middleman and bring the spa to you in your new floor plan with an amazing master suite. De-stress and rewind with calming colors and a comfy place to rest your weary bones. And don’t just head to bed at the end of the day – make living in your master suite an experience! Keep these must-haves in mind and you’ll enjoy every moment of serenity in your new house plan’s in-home spa! You won’t want to miss out on this collection of Great Master Suites! Your new master suite is more than just a place to lay your head. Add comfortable furniture for casual seating throughout the room. Make sure to keep the color scheme to light and earthy tones so it creates a natural air of relaxation. Add greenery or a bouquet of sweet-smelling flowers to add life into the room. The sitting area will be your new favorite spot, with its cozy lounge chair near large windows. Here, you’ll enjoy soaking up warmth from natural sunlight while taking in that view! The simple things in life make all the difference. And a bench at the end of your bed provides an easy place to be seated while getting ready – and who doesn’t love a bit of extra storage space!? Natural light can be hard to come by in the more private spaces of your home. The master suite is no exception. Fear not, there’s more than one way to let the light shine in! With wide and high windows, you can let the morning light pour into this space without the worry of onlookers. 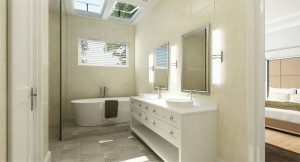 Plus, you’ve likely heard of kitchen or living room skylights, but why not add one in your master bathroom? This natural light will bring a boost of energy to your morning routine that can be carried throughout your day. And for the make-up artist in the family, you’ll look incredible for your night on the town. There’s nothing better than a good primp while cascaded in evening light! Take back your elbow space with a double vanity in your new master suite. 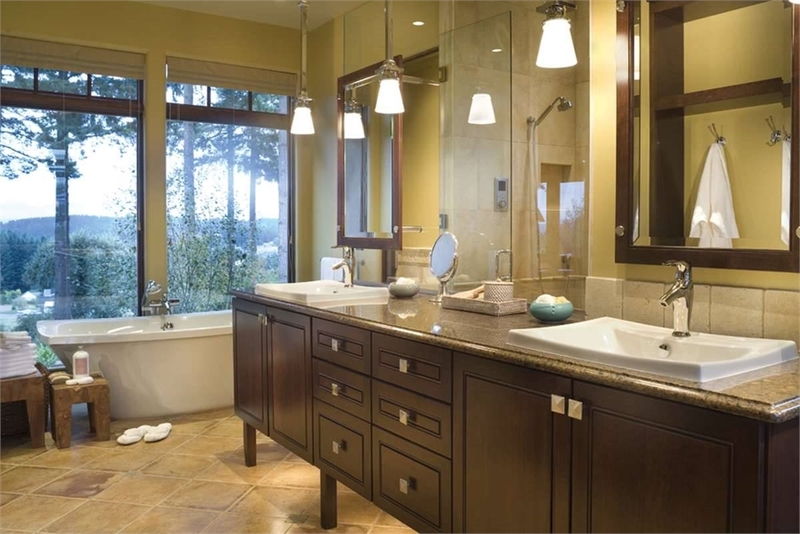 You will never regret the decision to add a second vanity to your bathroom, and neither will your spouse! Does he complain about the dozens of face and hand creams that surround your sink? Keeping clutter at bay becomes easy with generous storage space throughout. Organize soaps and towels beneath your vanity, while curling irons and beard trimmers stow nicely in drawers placed between your his and hers sinks. Go all out and add a tall cabinet atop your counter for hiding small odds and ends as well! Walk-In Showers & Jacuzzi Tubs, Oh My! Who doesn’t love a day at the spa? For just for a moment, can you imagine enjoying that same spa-like atmosphere without even leaving home?! Just draw a warm bath in your large soaking tub. Sprinkle in bath salts or a bath bomb of your choosing, while soft incense and music fill the air. Plus, you’ll never have that annoying moment when someone tells you that your time at the spa has ended. No time for a soak? Don’t let a quick shower go without its enjoyment. Add a separate walk-in shower that boasts sauna-style seating or multiple shower heads for a pampered experience. Read, relax, unwind. Your en-suite is your sanctuary. Now that you’ve taken care of the master suite, it may be time to consider your kitchen options. Get ahead of the game by reading up on How To: Create an Incredible Kitchen or browse our collection of Fabulous Kitchen House Plans! Bookmark this article Your New Master Suite Becomes an In-Home Spa!